"A last wish, family secrets and a long romance make this a delightful read"
Simeen, her husband Nirvaan and their best friend Zayaan all live together ever since Nirvaan has been diagnosed with cancer. Knowing each other since they were teenagers their friendship kept them together through thick and thin, but during their 30th year, Simeen, as well as Zayaan, will be forced to make tough choices regarding themselves, their needs and desires. Can the three friends keep up their friendship dynamic or will their final year change everything between the three of them in one way or another? 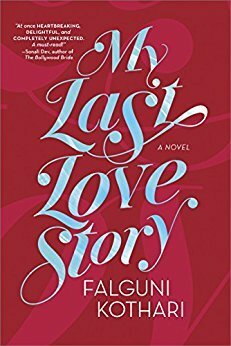 Bursting with a raw and primitive talent, MY LAST LOVE STORY by Falguni Kothari is a story that dares to explore a friendship between two men and one woman as well as introduce the reader to the culture of South Asians from India that make their homes in America. MY LAST LOVE STORY is an unpolished diamond in the rough that will dare to question societal norms and what ultimately is "normal" and "not normal". MY LAST LOVE STORY veers sharply between romance and women's fiction genres and tends to be raw and, without a warning, MY LAST LOVE STORY switches the two so quickly that its reminiscent of sucking on a gobstopper candy. The exploration of the world and characters are more focused on Simeen and the love triangle she has with both her husband and Zayaan as well as her secrets and her indecision in whether or not she wants to follow Nirvaan's wishes. Simeen questions, double questions, even triple questions the bond she has developed with Nirvaan and Zayaan and what is the right choice? Aside from the focus on friendship, MY LAST LOVE STORY focuses heavily on family and relationships between siblings, parents and their children and between in-laws which is something rare and unusual in a plethora of novels of this genre that are replete with romance. People in MY LAST LOVE STORY are all too human in a real world and are more likely to be remembered than forgotten. Ultimately, MY LAST LOVE STORY is a story of unconventional choices, and people who enjoy diverse reads and want to learn something more about South Asians living in California in America will be wise to choose MY LAST LOVE STORY. Simi Desai is thirty years old and her husband is dying of cancer. He has two last wishes in his final months: first, that she'll have his baby so that a piece of him lives on, and second, that she'll reconcile with her old flame, who just happens to be their mutual best friend. And so over the course of their last summer together, Simi's husband plans a series of big and small adventures for this unlikely trio, designed to help them say goodbye to each other and prove to Simi that it's okay to move on without him�and even find love again.